← 140 Minutes of the Night. The Chamberlains. Commissioned portrait, Summer 2010. Final 70" classical framed canvas hanging in client's home. This journal consists largely of my fine art, but I don’t restrict my work to pictorials. Classical art is often composed of commissioned portraits, and the pieces are no less because of it. So when I make a portrait, I make it for my client’s needs, but creatively, I want something stunning enough that it could hang in museum ten decades from now. We planned the Chamberlain portrait for weeks. I was determined to avoid the stereotypical toy solder line of people that is so common, especially in very large groups. We planned this to be a wall piece, and we succeeded. It now hangs as a handcrafted, seventy-inch canvas in the client’s living room, and, I confess, I’m very proud of it, though it’s not done justice on this tiny screen. I wish you could come to the studio and look at the one on my wall. This image set a new standard for me in proving to myself that a group portrait need not be a stereotypical clustering of people with grim faces and awkward poses. It also won best photo at the Winter Fest art competition, which was really cool. 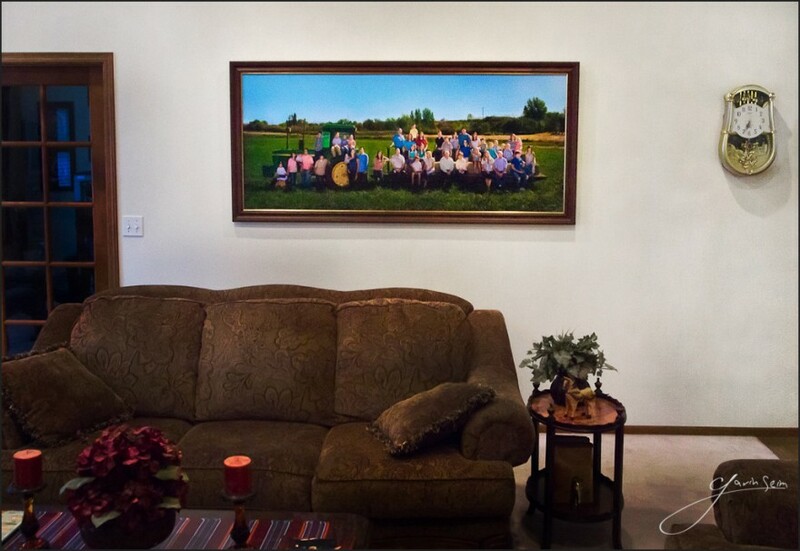 I’m thankful that I was able to capture this family in way that shows three generations, tells a story, and hangs beautifully on the wall. In planning this, I opened up a world of new ideas for the way I conceptualize commissioned pieces. A closer view of the final image. For photographers. How it was made… Canon 5D2, 24-70L, f11, ISO200. 1/100th sec, 3 Alien Bee 800 strobes. This was the culmination of about two weeks of planning, starting with a client consultation, then a visit to their neat little farm in Central WA. I scouted around looking for ideas, and finally we settled on the idea of making the portrait in dad’s alfalfa field, with the tractor, trailer, and bales of hay. Time was also an issue. This was in July, and, due to family members’ schedules, we needed it done at 11AM on a Saturday. That would put the sun behind them and to the right. Bad, but at least it was not shining directly into my lens. I scouted for the best spot, not counting on clouds and hoping to find some way to avoid the harsh light. But, ultimately, this was the view we needed, so I had to make it work. I started with a very rough sketch of how I would set up tractor, trailer, bales, and subjects. Planning ahead makes the difference in a good portrait. I knew better than to make this as one of those “meet me at 10am we’ll see what we find” sort of projects. Over the next few weeks I planned. A LOT. I considered setups, lighting, and handling the harsh sunlight. I talked to some of my wall portrait mentors like Ken Whitmire and Sam Gardner. They agreed that while it was a challenge, it could be done, and helped me consider lighting ideas and approaches. I ran various setups, made special tie downs for my light stands, ran tests in the sunlight, and kept planning. The day before, I went out and helped the family set up. Everything was in place and looked good, but, wow, was that sun sunny. Direct sunlight means harsh shadows and ugly portraits unless you have a way to balance it out. The strobes would be my solution. Next morning, I came an hour early and started setting up. I had borrowed a few extra Alien Bees from my friends, the Nickles, and was ready to go. As it turned out, I had no assistant, and I was on my own. Not the best idea, but I managed. I won’t say I was not nervous, but I was ready to go. I wanted an landscape portrait, not one with a glowing, blown-out background. My plan was to key to the background, meaning expose so the background area would be natural and fill in the faces using the strobes. I settled on three strobes for a total output of around 1200 watt seconds punching into the group from the front. Here comes the family. All forty-two of them, the youngest about one year old. Now, it was crunch time. In a group this large, people get tired and hot fast. I told them to start by taking places on the bales in rough family groups. I generally let groups place each other to start with. It’s never perfect, but it keeps me from having to shove each person into place. They get themselves comfortable, and then I refine the pose, making sure everyone is where they belong. After some re-positioning, I started capturing images. In a way, they were still test frames because I was analyzing the pose and focus details and checking the light. I had to run over and modify the setup a few times before it felt right. But I knew I had to move, or people would get tired of me very fast. I had set up on a tall ladder to get their heads out of the sky, and that’s where I worked from. I was around thirty feet in front of the group. I took plenty of frames; probably more than I needed, but with a group like this, I knew wanted choices so that an eye blinking in one frame would be open in the others. I also tried variations on exposure just to cover myself. The lights worked well, though I did end up moving one or two and fighting minor issues with them triggering each other (probably due to the bright ambient light). Something to experiment with next time. Or, better yet, use radio triggers on all lights. I was using bare bulb right out of the front cone reflector because an umbrella would reduce the light too much and at this distance let the light spread out anyways. In retrospect, I could have had a few more strobes, but the bottom line is that I was punching in a lot of light, and it was enough to compensate for the sun. I had done it. We did a few smaller groups, but having the main one finished was such a load off my mind. After I got home, I went back and checked to make sure I had not somehow messed things up. All was well and now phase 3 begin. Post was a lot of work as this is not a simple frame taken from camera and sent to print. I did initial edits in LR, getting things looking good, then doing essential cleanup, burning and dodging in PS. Next, I met with the client. After some deliberation, the client settled on this image as a 70in framed Signature Canvas (not inkjet canvas). On a print this large, I had to take my time with final edits and make sure I did not get artifacts as well as do some up-rezzing. Even with the 21MP of my 5D MK2, I really have to work to keep quality high. Every face was analyzed to make sure it looked good. If a bit of digital brushwork was needed, a clump of grass needed fixing, or even a head swap from another frame with a better expression, it was not withheld. In that respect, I look at these commissions much like a painter. I’m making a piece of art for the wall and each subject needs to be well represented. I had the first print made, a 30×70. It looked good, but I was not satisfied. At this size, there were too many visible artifacts and pixel issues. Canvas is a neat medium because aside from being timeless, it hides imperfections here and there due to the texture. No matter, I wanted the initial print to be as good as possible. After some analysis, I went back a few steps in the file process to before I had resized for the final print. I probably spent another 3-4 hours carefully refining and up-rezzing it for another printing. Then I sent it off again. Print number 2 came back. I was really excited now. After analyzing and signing the approved image, I sent it to Whitmire’s canvas shop to be stripped and mounted. Ken, one of the mentors I mentioned earlier, was thrilled with the results. But he wanted to give it the works to make it look as good as possible. That included having a retoucher do a little bit of dye work on the print itself. Then the image was stripped from its backing paper, mounted to a high quality canvas, and stretched over frames. Once that was done, there would be some glazing and clear brushwork to enhance the tone and texture a bit more. Finally, about 5 coats of clear lacquer were added protect everything we had done. When I picked it up, I need not tell you how proud of it I was. I plan to do many more of this size in the future, but this represented in a big way my new, more recent approach to wall art. I took it the same day to my framer who had already ordered and received the stock you see in the final image above. A week later, he had them ready to hang, along with the two smaller prints we had made from this session. You can see those on my portrait website. Oh, how framing gives that finished touch. The presentation is so important. Back in the studio, I made the proper certificates of authenticity and soon after went to hang them myself in the Chamberlain home. This is something I like to offer, especially on larger pieces as they can be heavy and daunting. I took my laser level and plenty of tools to do the job. A while later, I made a print for my studio in the same size and style. It actually won Best Photograph at the Winter Fest art competition, and, more importantly, it now hangs on my wall so I can convey the idea of appropriately sized wall art to future clients. This entry was posted in f164, journal, signature, technique and tagged art, f164, family, heirloom, portrait. commisen, wall. Bookmark the permalink. Hey Lee, thanks so much.